The Tommy Fuss Team has walked over 1,600 miles in the course of participating in the annual Out of the Darkness Overnight Walks since 2007 and has raised over $200,000 for suicide prevention! Dan and RoseMary Fuss also made a major gift in 2012 to the American Foundation for Suicide Prevention to sponsor a two-year AFSP research study. “We are excited about what we are going to learn and to collaborate with AFSP,” said RoseMary Fuss. 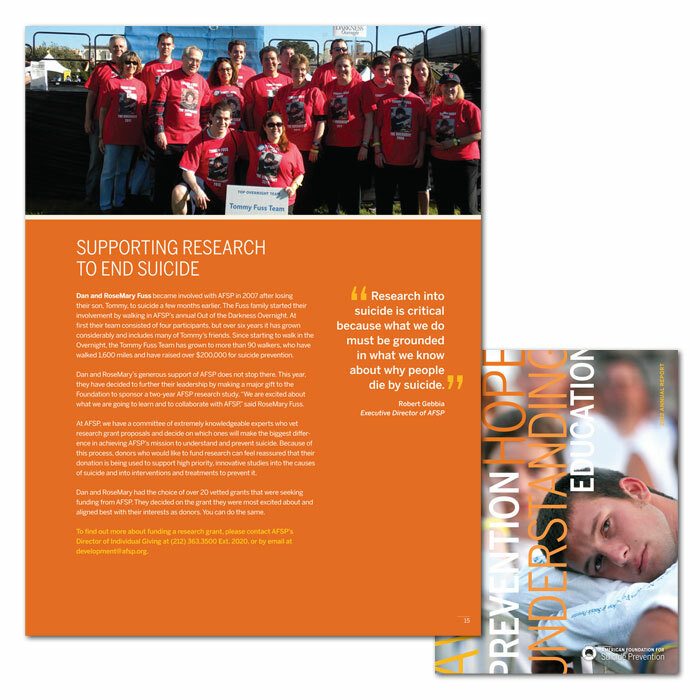 To read the related article, “Supporting Research to End Suicide” which appears in the AFSP Annual Report 2012, click on the image below. To view the Supporting Research to End Suicide page, click here. To view a PDF of the entire AFSP Annual Report 2012, click here. (Note: this is a large file, please allow a moment or two for it to load).